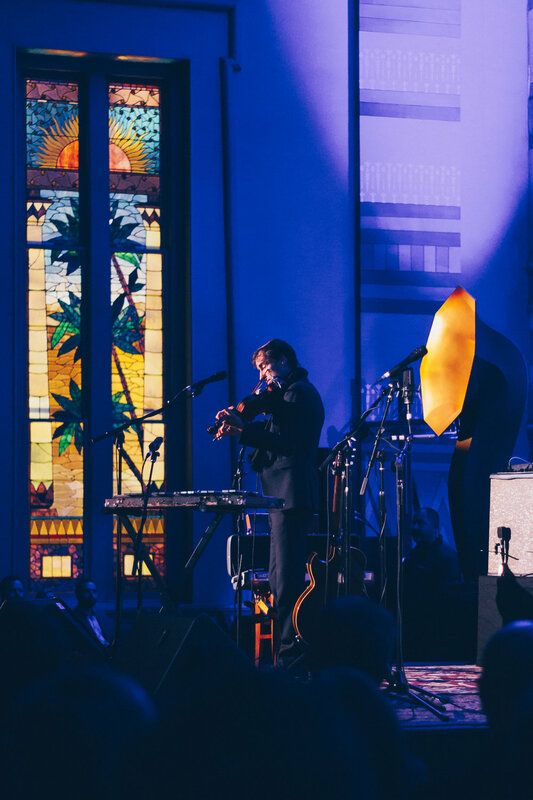 Andrew Bird has a way of creating a sound garden, not only through his music, but particularly through the unique locations of his concerts. When I heard that the show could take place in the Downtown Presbyterian Church in Nashville, a Egyptian Revival-themed cathedral built in 1816, I knew that this would be a one-of-a-kind show. Even though he was burdened from recently relocating his family temporarily to Nashville due to the wildfires near his home in Los Angeles, Mr. Bird filled the night with a humble but full show with only him and his bassist, Alan Hampton. The soft strings and contagious whistling flowed out of the giant Victrola-like horns, even some that spun wildly to create a magical Doppler effect that bounced off the brightly lit Italian stained-glass windows. Onstage, his new songs from Echolocations: River and even his older tunes had more distinction, warmth, and flexibility than they have on the albums, sounding more like an evening in his living room than an auditorium. He finished out the night with some bluegrass tunes and Neil Young’s “Harvest,” which was perfectly fitting for Nashville’s roots. Overall, the show was a excellent representation of Mr. Bird’s heart and soul and has left me whistling (or at least trying to) his songs throughout this following week. We wish the band the best as they return home to recover from the LA fires, and feel free to come celebrate some more Gezelligheid back here in Nashville anytime!